Pounds for Dolls- Fangtastic Fitness Support Group Challenge! Re: Pounds for Dolls- Fangtastic Fitness Support Group Challenge! Great idea True! I'm about to move out and then I'll also be doing all the grocery shopping, so it's my goal to further cut out junk food and buy more healthy food when I go shopping. I know what you mean about gyms... The one I'm looking at is 13+ bucks a WEEK. Doesn't sound like a lot initially, but if I go for a year, that'll be like... 700+ dollars. Which I guess is worth it to comfortably get in shape, but it's still a lot for me to think about. Just a couple more days until our start date! Who else is excited? I'm totally in. Writing up my submission post right now. Worst habit(s): Binge eating. After work, making meal decisions that are convenient instead of what’s best for me. I love high intensity cardio exercise (I run, hike, snowshoe, bike, etc. ), but when time is limited in a day, that is the first thing to get cut. In my mind, if I don’t have at least an hour to dedicate to the activity, then it’s not worth doing. Also, I need to stick to a resistance training program. Every time I start using weights, I’ve always abandoned them and as a result, I have very little upper body strength. 1.) What is your main goal that you hope to achieve with this challenge? To lose weight and make exercise a priority each day. 3.) What habits do you want to break? Binge eating. Making convenient meals instead of healthier ones. Recognize that any exercise is better than no exercise, so being content even with short sessions in a day. 4.) What habits do you want to develop? Preparing meals in advance so I’m less likely to take the easy road. Start and stick to a resistance training workout. Make exercise a priority most days, and be okay if I only get in 20 minutes. 1.) What program will you be following (in detail! Let's plan our success and stick to it!). Start a resistance training program 2 days a week. On the weekends, start making week day meals in advance, portioning them out in tupperware for individual days of the week. 2.) What steps are you going to take to improve your nutrition? Having healthy meals prepared in advance. Portion control will be my aim. Making sure I have healthy snacks on hand at all times as well. 3.) What are your reasons for wanting to join this challenge and get healthier? There are a lot of things I already do right when it comes to my health, like walking 15 minutes each morning with a coworker and incorporating vegetables into almost every meal I eat. And when time permits, I love high intensity cardio exercise. However, I know there are decisions I’m making that sabotage myself, and I need to replace those bad habits with ones that reinforce the good things I’m already doing. 1.) What are you going to reward yourself with? It doesn't have to be dolls at all! For every point I receive, I’m going to put $1 aside to spend. I recently purchsed my first BJD doll. Although the initial money was a pretty penny, I learnt the spending continues when trying to purchase a wig, shoes (man, are their shoes expensive! ), clothes, etc. for it. I've been putting this off, but no more... I'm in! 1.) What is your main goal that you hope to achieve with this challenge? I hope to get back on the exercising train again. It was easier when I lived at my dad's and I had an outdoor gym two streets away, but I'm house-sitting and there's no outdoor gyms around here and I hate exercising so any excuse not to do it is good enough for me! 2.) What is your goal weight? 150 pounds. Ish. I don't expect to get there on this challenge alone (there are medication and thyroid issues involved) but it's a good start! 3.) What habits do you want to break? Not exercising at all because I'm lazy and I hate it. Eating whatever is easier to cook because I have no motivation for cooking for myself alone. 4.) What habits do you want to develop? Almost-daily exercising, even if it's just a long walk. Cooking nicer and healthier food for myself. I will be exercising 5 days a week, be it a long walk, following an exercise video on YouTube, dancing for an hour... something that gets me moving! 2.) What steps are you going to take to improve your nutrition? Buy more vegetables. Cook one day a week, but make enough food to freeze/keep in the fridge so when I'm feeling lazy I just have to put it in the microwave and I have healthy food ready. 3.) What are your reasons for wanting to join this challenge and get healthier? Medication and health issues are making me put on a lot of weight, and mental health issues make it hard for me to motivate myself to do anything about it. I could do with the outside support and encouragement! 1.) What are you going to reward yourself with? It doesn't have to be dolls at all! I'm thinking about getting Disney Descendants Uma as soon as she comes out, but for smaller goals I'll be rewarding myself with finds from second-hand stores. Had a bad anxiety attack this morning so I didn't get to work out. I think I'll try doing some work now that I've calmed down and then work out before bed though, so hopefully I can still salvage the first day of the challenge! Did you make a Doll of yourself? That's Awesome!! I've actually done a low carb diet, but I'm going to guess that most people would not consider it to be healthy, not with all the current trends, besides I think it's too late to start into this. Writtenhuman, sorry you had a rough start. Anxiety is never fun. I'm having a bit of a tough time myself getting going, especially with leaving junk food alone, although I am biking a lot. Well, any change for the better is progress! We just have to take the wins we have, and keep working on the stuff that we haven't mastered yet. What kind of junkfood are you having a problem with, out of curiosity? I have some methods I use for helping myself avoid it, but it depends on the kind. On Monday, I didn't work out, but I did walk 10 blocks, and then 8 blocks back carrying a tote full of fruit and veggies (pic of my loot under the spoiler). Yesterday and today I've been doing YouTube exercise videos. Nothing super-hard, but enough to leave me sweaty and aching a little. It's hard to find exercise videos that hit the right tone for me (not too hard, host not too cheery and definitely nothing with the word 'bootcamp' in it)! And for this week's challenge, here's Teresa ready to exercise with me! Where did you get that doll outfit from!? I love it really inspirational! Ill be posting my image soon. I walk/jog daily. My Gym membership has gotten regular use! I am so happy to be part of this gym! All last week I couldn't go because I was watching my nephews over the spring break, However we did visit pools every other day and I did a looot of swimming. This week I kicked into gear and have started going mondays, wednesdays, and Fridays, until I figure out a normal rhythm and will probably start going more. After that i've been trying out different upper body machines, seeing what I like and testing my limits. I might start going every day, but doing light workouts every other day. Like I know I can at least walk three miles a day last summer's experience, but It's kinda hard to do in my neighborhood. Right now, I'm having trouble with sugary cereal. I just get bored and pour myself a bowl. I think after this bag runs out, I'll buy myself a healthy cereal, or some more oatmeal so I CAN'T munch on it at all times of day. Great pics, by the way! Dfotw, I love that mini yoga mat. And writtenhuman, your custom doll is so cute! I always love seeing her. True, I meant to say earlier, that snack bowl is such a good idea! I need to get some healthy snacks and do something similar. True, great job! I haven't gotten to hit the gym yet myself (big paper to write that I keep putting off :S) But I'm excited to get into my campus' gym next week if I can. KustomKara and danbo, thank you! 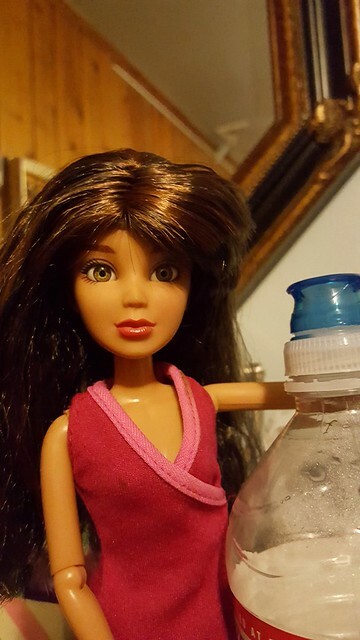 The outfit is cobbled together from different pieces: the top and shoes (and maybe the water-bottle) are Barbie, the sweatpants are from a Liv fashion pack, and the yoga mat I made from a scrap of drawer-liner. Drawer liner! That's so clever. I'm working, and sick, so I'm not biking as much right now. Planning to bike across town and back on Monday morning to do some errands. In the meantime: Yesterday I resisted the siren's call of McDonald's on my way to work. Never been so proud of myself. I'm also trying harder to stick to my new diet, not eating a bunch of junk at home and work. Nice Danbo! For the sugary cereal, do you like overnight oats? Oatmeal + a little honey and milk (almond milk is great!) and whatever else (raisins, vanilla, cinnamon, peanut butter...) stuck in the fridge. I've found you only need to leave it in the fridge for 10 to 15 minutes, not overnight. Might be something to try since it's cereal-y and requires a short waiting period so it's not an immediate gratification thing. I haven't worked out a lot this week, but I did a little extra walking today and plan on going to the gym tomorrow. Batgirl posing on my bike this morning before a ride on the rail trail. As for my first week, Sunday I spend a couple of hours making dinners for the week and it was a big success! So much so, that I spent another couple hours this morning making dinners for this coming week. I got plenty of cardio in. However, I did not do any resistance training, which was one of my goals. I'm willing to run for an hour strait, with my muscles and lungs burning, yet, I'm not willing to lift weights for even as little time as twenty minutes. I don't know what I can do to motivate me. Hey! How is everyone's second week going? I realized today it was almost over- where has April gone? !- so I hurried to get a picture of a nice healthy meal. Peel the cucumber. Cut it into fourths lengthwise and then medium dice. Wash and dice the tomatoes. Combine in a bowl, sprinkle with as much or as little feta as you'd like. Pit and halve the kalamata olives, mix again. Combine equal parts olive oil and red wine vinegar (and a little kalamata brine if you'd like! I do.) for the dressing, drizzle over the salad. Optional: serve on a bed of spring mix/lettuce with croutons. I also like to eat it with a warm piece of pita. I also made an eggplant lasagna last night- it turned out... okay. :S I don't like eggplant, turns out. I like my mom's veggie lasagna better! But here's the recipe for anyone who wants to try it out. https://www.blueapron.com/recipes/free-form-eggplant-lasagna-with-spinach-noodles I love this site btw! Lots of great recipes. This is my favorite pasta replacement. I take a zucchini, a red pepper, and two jalapeno peppers and cut them into thin pieces and then broil them. Then I add raw shredded carrots (or cut my own carrots). Then mix it all up with my favorite jarred tomato sauce. You can omit the jalapeno peppers if you don't like the heat and can also make your own tomato sauce. You can also add a serving of pasta to it if you want something more than an all vegetable meal. I have some corn on the side this time, but I also enjoy this with veggie dogs or something else that pairs well with tomato. For challenge 3, I can’t really share any workout music, as I don’t listen to music when I exercise anymore. I once did, and found up-tempo, fast beats, and motivational songs often got me moving harder and faster than I think I would otherwise. However, for some years now, I get little enjoyment in music and now prefer podcasts when exercising (or cleaning, or commuting, or anything, really). My favorite is “We Have Concerns”, a comedy/science based podcast. I also enjoy video game based podcasts, like “The Giant Beastcast” and “The Easy Allies Podcast”. I listen to others, but these will count as my favorite “three songs”. Oh, and I promised another meal due to being late last week. This is garlic hummus and light mayo on a Joseph’s Flax Lavash Bread. The fixings are: lettuce, tomato, carrots, onion, celery, red pepper, and jalapeno with a whole dill pickle on the side. I won’t lie; I have a thing for red peppers and include them in any meal that I find they work in.